As a writer, I exist mostly on coffee and imagination. I would be useless on The Pier without my morning shot of joe–although the full pot of filter I got through by myself the other morning was perhaps overdoing it a bit. Mind you, coffee has benefits above and beyond the obvious slap to the nervous system and creative glands. Throwing away the grounds after you've extracted your mug of go-juice is a waste of a handy resource. It's been long known that spent grounds can go into compost. In fact, Starbucks will give you a bagful if you ask nicely. The aromatic powder is also good at keeping cats off your lawn if they have a tendency to use it as an alfresco toilet. But it's the naturally deodorising properties of coffee that have the fashion world shaking out their filters. Once stripped of its more fragrant compounds so you don't smell like a fresh mug of Sumatran Blend, coffee grounds have all sorts of uses in clothing. American Eagle have laden their new range of jeans, Denim X Café and Flex/Café, with 2 and a quarter grams of spent coffee grounds per garment. They claim that it wicks away moisture and protects against UV rays. The deodorising benefit of the grounds also mean that you can get away with a few more wears before washing–an environmental benefit that we've long preached about here at The Pier. American Eagle aren't alone in seeing the benefits of scooping out the contents of that old cafetière. Good old M&S launched a range of shoes earlier in the year made from waste that included plastic bottles and yes–those grounds. Knicker specialists Sloggi released a range of underwear around the same time made from waste coffee. Focussing on the deodorising properties of the grounds, a British startup called The Ministry Of Supply brought out a set of socks loaded with the stuff. How they deal with a heavy case of the caffeine sweats after an all-nighter on the java is not adequately explained. All of which goes to prove one point that's a key tentpole of ethical fashion. Innovation is key, and no resource, however unlikely, should be overlooked in the quest for new and interesting products. It's a criminal waste to chuck away your grounds when they could go onto the garden. If they can be of added benefit in clothing that helps to keep landfill sites un-used, then that's all to the good. Fashion–it's easy, right? Sketch out a couple of designs, sew 'em up, sell 'em online, boom, job done. Wash, rinse, repeat until rich. It's nothing like that, of course. Fashon is a huge business, earning trillions worldwide every year. Supply chains are deeply complex, with different elements of a garment coming not just from different countries but seperate continents. Products are difficult to get right, and making the connections a burgeoning start-up needs to succeed is a tricky proposition. If you want to work sustainably, the challenge increases massively. 91% of clothing companies don't know where their cotton comes from, opening themselves to the risk of sourcing from slave labour. Poor labour practices run rife, and the fashion sector is the second most polluting in the world. Where do you even begin? A new resource that hopes to answer exactly those questions is now looking for funding. Mysource, the reincarnation of the Ethical Fashion Forum, seeks to connect fashion professionals from all sides of the trade, from designers to suppliers, enabling the right choices to be made. The end result: promoting sustainable practice in the fashon world on a much larger scale than ever before. This is a step change for the Ethical Fashion Forum, who have seen interest in eco-fashion jump massively in the last five years. Innovations created by the EFF like online-only conferences have made it easier than ever for manufacturers and designers to meet, chat and do business. Mysource aims to take that model to the next level. With disasters like the Rana Plaza collapse still fresh in people's minds, the time is ripe for ethical practice to take centre stage in the show they call fashion. Rather than gradual inroads, it's time to take fashon by the scruff of the neck and march it into the future. This is an incredibly exciting project, and The View will be watching it closely over the coming months. For now, if you want to know more or even get involved, check out http://mysource.io/ or the Crowdcube funding page at www.crowdcube.com/mysource. 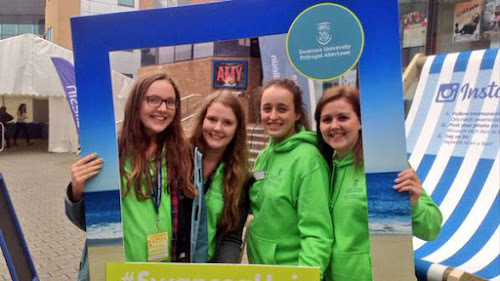 A couple of weeks ago, Swansea University held its Undergraduate Open Day: a chance for dewy-eyed newbies to start to get to grips with college life at one of the prettiest campuses in the UK. 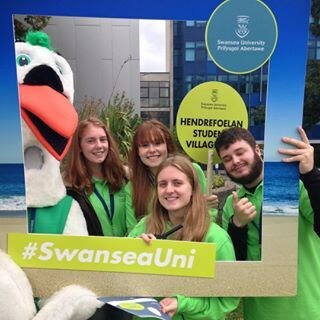 It was a rambunctious affair, with plenty of opportunities for selfies with the University's seagull (or maybe a swan?!) mascot. Student ambassdors were on hand to help out with questions and guidance. They were easily spotted, as they were wearing bright green polos and hoodies you could see from a mile away. You can see where I'm going with this now, can't you? Those tops were provided by Pier32–as they have been since 2006. Gerry, the Voice of Pier32, tells me that our relationship with Swansea University started thanks to our strong stance on ethical and environmental issues. Since then it's gone from strength to strength. We supply tees, hoodies, hi-vis and jackets for the Fresher's Fair, and the full gamut of clothing for Residential Services, from Workwear Trousers to tabards. The College of Sciences and English Language Training schools order t-shirts from us as well. There's a general air of opinion amongst we ethical fashion types that fast fashion can do no right. Companies like Zara, New Look and especially the best-known UK name in the sector, Primark, are guilty of everything from the pushing of micro-trends to poor quality but super-cheap clothing, factors that keep people buying and a steady stream of non-recyclable clothing heading for landfill. Employee expoitation and dangerous working conditions are all par for the course. So far, so obvious. The real story is, of course, rather less simplistic. Did you know, for example, that Primark were one of the first companies to offer compensation to the victims of the Rana Plaza collapse–and that they contributed an amount above and beyond their legal obligation? Furthermore, the company have become the latest signatory to the Sustainable Apparel Coalition (SAC), a non-profit organisation that monitors the Higgs Index of a brand. Higgs Index? Well, this is a self-assessment tool developed by the SAC that allows companies to calculate the sustainability performance of their supply chain and identifies areas that need to be improved. It assesses both the environmental and social impacts of products. "By measuring sustainability performance, the industry can address inefficiencies, resolve damaging practices, and achieve the environmental and social transparency that consumers are starting to demand. By joining forces in a Coalition, we can address the urgent, systemic challenges that are impossible to change alone." Parse that statement, and a couple of interesting points emerge. Firstly, they note that changes to transparency and the elimination of "damaging practices" are things that customers are starting to call for. In other words, advocacy of a more ethical fashion sector is starting to make a difference. Consumer power is a real force in moving away from the old toxic models. Secondly, Primark is very clear that they can't do it alone. Which is why joining the SAC is such a smart move. It has a membership that includes big brand names like Adidas and H&M, agencies including the Environmental Protection Agency as well as non-profits, academic institutions, Uncle Tom Cobley and all. No-one wants to be the first to jump into a new supply chain structure. But by teaming up with a group that can provide a good theoretical and legal framework for such a move, when it happens it's more likely to be a success. Look, I'm not saying we should all suddenly rush out to Primark to show our support. But it's important to realise that sometimes the bad guys aren't quite as evil as we like to think, and that painting any issue in black and white ignores the subtle hues that are much closer to the truth. What is the future of charity? Some could argue that, with swingeing government cuts to essential services, it's needed more now than ever. At the same time, the funding these charities need is also facing a severe haircut, and austerity and bad publicity mean that people are less inclined to dig in their pockets and donate. It seems hopeless, but there are always opportunities if you know where to look. Innovations in technology have given charity donation a real boost, with online initiatives like the Ice Bucket Challenge raising millions for motor neurone disease. Giving a fiver to charity is as easy as firing up PayPal. The next big thing is around the corner, and many charities are working hard on smart ways to raise awareness and pull in some cash. The drama was inspired by a real app, iHobo, that aimed to show what life was like for a homeless person. With shades of Charlie Brooker's Black Mirror, iHomeless shows what can happen when interactivity goes that little bit too far. 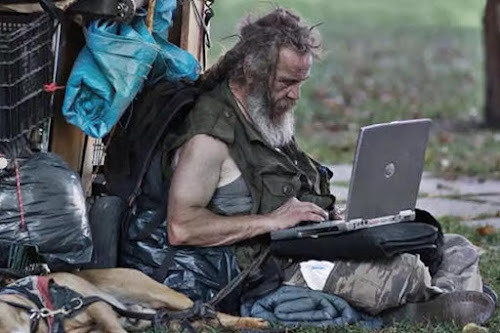 In a bit over six minutes, it skewers our attitudes to homelessness, and the way technology can make us a little too complacent about matters of life and death. iHomeless is a Tin Can Podcast production, written by Jonathan Brown and edited by Fred Fournier. Starring Fiona McKinnon, Ashley Hope, Keith Eyles, Chris Spyrides and Dave Bibby. We work with a lot of lovely community clubs and charities here at The Pier, but none have given me a glow recently quite like Hippotherapy Northumberland. Let's dispel a few misunderstandings right off the bat. Hippos are not involved in any way, means or form. This is not some weird mis-spelling of the word "hypnotherapy". No, hippotherapy uses the characteristic movements of a horse to provide carefully-graded motor and sensory input to kids with disabilities. Simply being on or engaging with horses has remarkable therapeutic results. However, the 3 dimensional 4 point movement of the horse stimulates normal reflex and posture. In conjunction with a therapist alongside who knows how to optimise the experience and therapeutic effect, hippotherapy helps to normalise and bring down spastic and high tone episodes. “The intention is to present this as an activity the child with disabilities can engage in and gain from, physically, emotionally, cognitively and relationally, and helps to encourage posture, strength and balance. “For many, it is the first time they can engage in a leisure/recreational pursuit and it is a very special opportunity that raises the quality of life for children with even severe disabilities. 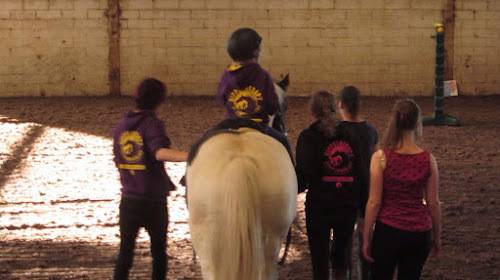 Founded in 2013, the club is going from strength to strength, and we're really happy to be supplying Hippotherapy Northumberland with hoodies. Angela sent us a shot of them in action. In further good news, Angela tells me that Hippotherapy Northumberland has recently attained charitable status. They're now looking for sponsors to partner families, which will help to make access to hippotherapy an affordable option for kids who could really benefit from it. Their registered charity number is 1163434, if you want to help in any way. Angela was supplied with Varsity Contrast Hoodies from the Just Hoods range by All We Do Is. It's very easy to point fingers at the big manufacturers when it comes to laying blame over the environmental and workplace abuses that have made fast fashion such a toxic proposition. But you need to remember that the big brands really don't like the negative publicity attached to their name. Slowly but surely, they're taking steps to ease back on the damage and actually start to do a little good. Let's bear in mind that names like Nike and Adidas have huge resources that they can bring to bear onto a particular problem. If they want to crack a nut, that nut gets cracked. Many of these companies now have CEOs at the helm that see the benefit in making their supply lines more sustainable. Five years ago, notions like cradle-to-cradle would have been unknown in the boardrooms of the high street big brands. That's no longer the case. Adidas are calling this, with a wrinkle of self-awareness, "game-changing." And they're not wrong. This could have massive implications for the footballing world. Parents with growing football-mad kids would no longer have to buy and bin a new set of boots every few months. Instead they could be remodelled and recustomised. All of this done without the need for toxic chemicals. Extrapolate this development up to the fashion world and you can see what a big deal Sport Infinity's innovations could potentially be. Closed-loop manufacturing would chop landfill waste numbers off at the knees and drastically drop the use of toxic nasties. The introduction of clothing that's easily customisable by the end buyer would mean a radical retink in tired old notions of seasonal ranges and sizings that don't quite work for the model-imperfect human frame. Sports technology is often an innovation pressure-cooker. Where they lead, the fashion world will follow. Let's put it like this. If a company as big as Adidas are looking seriously at closed-loop recycling, then it's about to become the next big thing. The big fashion shows are all well and good, but sometimes it's worth checking out the events that aren't at the top of fashion editor's lists of must-attends. Frequently, that's where the most interesting work is being done. Take Brighton–a lovely place, but not a big signal on the fashion world's radar. They're missing a trick. This year, those of us with an ethical eye would do well to check out Brighton Fashion Week starting on October 15th. This year's event focuses on sustainability. The theme is disrupton: re-invent the way we design garments, re-think how we consume and re-define what is possible through valuing and renewing existing materials. To that end, consumer group Love Your Clothes and Cancer Research UK are bringing the party to Brighton, in the shape of a tonne of old clothes. I'm not exaggerating. A lorryful of pre-loved clothing will be arriving at the Brighton Open Market, along with a challenge to students and designers–make something with that. Visitors are encouraged to rummage through the pile to find items that they can reuse or retask into a new garment. Not sure about your sewing skills? No problem! There are workshops on Saturday 17th run by local specialists Sew Fabulous and Eco Makers Emporium. They include basic sewing machine and hand sewing sessions to give beginners the practical skills and confidence to tackle simple projects, as well as classes on upcycling old clothing into stylish accessories. Visitors are also encouraged to bring and donate their own unloved items. After all, it could find a new home with an eco-fashionista that knows just what to do with that old top you've fallen out of love with. The whole point of the exercise is to get people thinking differently about the contents of their wardrobe. In the UK we buy and bin a million tonnes of clothing a year. Fifty per cent of these clothes are re-used, but around 350,000 tonnes of clothing goes to landfill despite all textiles and clothing being requested for recycling and charity donation. That has to change. An event like this is a great way to get the public engaged about simple ways to make their wardrobe more sustainable. Leather, as a fabric, is ingrained in our history. The tanned and scraped hide of cows has been used for centuries as a hardy, hard-wearing and weather resistant base for everything from shoes to armour. There's nothing else that comes close. Well, maybe once upon a time. But we live in the 21st century, and these days we can create marvels. The leaves of the pineapple are normally considered to be useless, a by-product to be shucked and binned. Usually they're left out in the field, to bio-degrade back down. But enterprising natives in the Caribbean noticed the toughness of the leaves, and decided to see what would happen if they dried and pulped them instead. The end result was a fibre that could be spun and woven into fabric. In its normal state, this fabric has the feel and flex of canvas. Increase the thickness of the initial weave, and you end up with something that has the durability of leather. Hey presto. Pineapple leather. Flexible and versatile, the stuff can be treated for use in all the ways you'd use cowhide: shoes, bags, jackets, you name it. It can be treated to look like snakeskin, and takes up colour like a dream. And as it's a by-product of the pineapple industry, it's sustainable and eco-friendly. There are other plant fibres that can be used in the same way. The leaves of the banana plant have long been revered for their toughhness and versatility. You can wrap food for steaming in it. You can use it for building: the interlocked leaves make a great, waterproof roof. But when you dry and pulp the stalks using the same techniques as for the pineapple, you end up with a very useful material. The tough outer fibres can be used to weave baskets, while the silky inner layers can produce a fabric as fine and soft as... well, silk. Once again, as a by-product of the food industry, banana fabric has serious sustanability creds. And, as banana grows without the need for pesticides, it's free from any toxins. Let's take a screeching left turn back into the animal kingdom. Humanity is great at finding uses for the most unlikely of materials. Take, for example, jellyfish. An invasive species, they wreak destruction on marine life and eco-systems. There are robotic shredders on the shores of South Korea that do their best to halt the influx, but the residue from that all-out assault is no less pleasant to deal with. As a food source, it's a bust. Jellyfish isn't really that tasty. What do you do with all those medusae? A design student from the Royal College Of Art, Yurii Kaseo, thinks he has a solution. He's developed a process by which the jellyfish "mulch" can be reformed into a tough, amber-coloured material with a whole host of uses. More importantly, it can be made without any need for the toxic chemicals associated with tanning. These all seem like crazy notions, but the thinking at their heart is pure sustainability. Taking by-products and unwanted materials and turning them into something useful without the use of toxic processes is something to be celebrated. And these are not pipedreams or experiments. You can buy banana fabric through the Offset Warehouse. These are practical solutions to everyday problems, rethinking waste and turning it into something people might want.